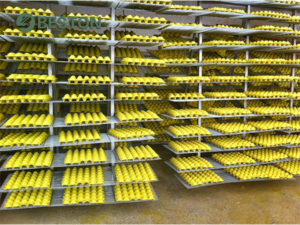 Beston egg tray production line is very popular among investors because of its low operating costs and high efficiency. It is applied to produce egg trays with waste paper as raw material. In general, a complete egg tray manufacturing line contains four sections, namely, pulp making system, egg tray moulding system, drying and packing system. Beston has focused on optimizing this production line for about 20 years so that we have rich experience to supply the most cost-effective egg tray manufacturing business plan to customers. So far, our egg tray production line has been successfully exported and installed in many countries, such as India, South Africa, Malaysia, etc. Meanwhile, Beston has also developed this manufacturing line to produce different pulp molding products, such as egg boxes, fruit trays, seedling nursery trays, bottle trays, etc. If you are looking for a specific egg tray manufacturing project report, welcome to contact us! Pulp molding machine is the key equipment of the whole production line, as well as the core product of a pulp molding machine supplier. Beston has more than 10 models of egg tray machines for sale. Here are more parameters for your reference. By comparison, the egg tray production line cost of Beston is much lower. For one thing, our egg tray machine price is cheap. When you check the parameters, you will find the power and raw material required are much lower. That is because we have simplified the production line to make full use of the energy. Meanwhile, the stability has been greatly improved to reduce the maintenance costs as well. In the long term, interesting an egg tray manufacturing line from Beston is a wise choice. The maximum capacity can reach up to 6000 pieces per hour. Once the egg tray production line comes to use, it will bring high returns. For one thing, Beston pulp moulding machine is automatic. In addition, all the other components are also well-organized and closely linked with each other so that they can work automatically. For the other thing, fewer workers and construction works are required. All in all, it is easy and safe to operate and maintain. d. Rich and cheap raw material sources. Old newspaper, offcut, old cartons and other waste paper can be turned into paper pulp. These raw materials are cheap and easy to collect. 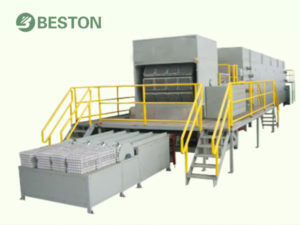 Moreover, Beston egg tray production line can convert waste paper into various trays effectively to save your investment costs. e. There are bright market prospects for pulp products. On one hand, pulp products are much in demand due to its portability and low cost. On the other hand, this production line is widely applicable to making all kinds of molded products, such as egg trays, egg cartons, seedling trays, fruit trays, shoe trays, bottle trays and even trays for electronics or other products. f. Conducive to the environment. The pulp moulding production line focuses on changing the waste paper into pulp products. In this way, the waste paper can be fully used. On the other hand, it performs without waste water or exhaust gas. In other words, it is highly possible that the investment project will be supported by the government and the public. The costs of an egg tray production line include the expense of mechanical equipment, especially egg tray making machine, the input to the labor force, occupied area, raw materials, maintenance costs, etc. We Beston can offer different kinds of pulp forming equipment with various yields for egg trays, shoe trays, egg cartons, etc. Our egg tray machine price is very moderate in term of its stable performance and long service life. On this basis, we also try to increase the output by consuming the same energy. In addition, we use scrap paper as raw materials, which is low in price and wide in sources. Moreover, the whole production line takes fewer workers and space. To sum up, our egg tray production line price is reasonable. We supply various egg tray making machines at different specifications. In a narrow sense, this production line is used to produce pulp egg trays. Broadly speaking, the egg tray production line is kind of equal to a pulp molding production line. That is to say, it is a production line made up of a series of equipment to make pulp moulded products, such as egg trays, seedling trays, fruit trays, bottle trays. As an environmentally friendly industry, pulp molding is growing quickly in the global market. Due to the high return on investment, this production line becomes popular soon. Furthermore, the whole production line is free from pollution and its products are degradable. Therefore, it is recognized as a green industry. Since it mainly produces packaging products, this production line also belongs to packaging machinery industry. As an experienced egg tray machine suppliers, our company never stops improving the performance of all equipment and lowering the complexity of all parts involved. Finally, we have made great progress in increasing the efficiency and reducing the energy consumption. Here is a video from our customer which may help you know the egg tray manufacturing line better. In general, the egg tray working process is simple. It consists of four systems, namely, pulping system, molding system, drying system and packing system. These four systems connect to each other. At the same time, they are also independent mutually. We can offer each system individually, as well as a complete egg tray production line. Pulping system is for changing waste paper into paper pulp through the shear force and friction force of hydraulic pulper. Then the pulp is transported into the storage pool after impurity removal. Considering the special properties of pulp products, such as waterproof agent, we often mix some additives with pulp evenly in the stirred tank at a certain concentration by pulp refiner. With the help of pulp pump, the refined pulp is eventually sent to the pulp forming machine. While pumping the processed pulp into egg tray machine, the forming molds above the stirred tank are immersed and filled with pulp. With the use of vacuum pump, the pulp is pressed and adhered to the surface of forming molds. At the same time, some water is removed out from the pulp. After dehydration, there is still more than sixty percents of water left. In order to move the wet products out of the forming molds, we employ transfer molds. The forming mold and transfer mold can perfectly match to each other in a concave and convex way. After demolding, you can choose a suitable drying mode according to your labor force, climate, fuel and space. Compared to the first two necessary links of an egg tray production line, drying system is easier to control. There are four main drying modes, namely, natural drying, brick drying room with carts, brick drying room with a conveyor belt and metal drying room. Natural drying is appropriate for the small-scale manufacturers, which greatly reduces the investment costs. However, it requires large space and nice climatic conditions. Given that, we offer more efficient modes to our clients. 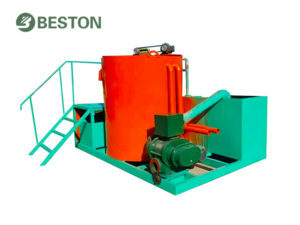 There is no fuel restriction for brick drying modes, while charcoal and coal cannot be used for the metal drying line. Through technological updating, our drying system can recycle the heat to save energy and accelerate the drying speed. Similar to drying system, egg tray packing system is optional. We can supply a counter at the end of the production line to calculate the number of products automatically. As for high-end products, such as shoe stretchers, we also provide a hot press machine to make them artistic. In addition, we have a packer to press products compactly to save more space. The most suitable and efficient egg tray making machine is acquirable from Beston Machinery. In addition, we can provide the best egg tray manufacturing project report to your labor force, climate, fuel, and space. Moreover, we promise to lower your egg tray manufacturing line costs. Welcome to contact us!